OCs are Tenipuri expies. Names are quite obvious. With a gasp, Kaidoss curled up into a sitting position and snapped open his eyes, green-black pupils slitting and flexing and he looked frantically around him. The violence of his motion nearly sent him toppling off the biobed that he had been lying on, if it had not been his strong hands seizing the edges of the bed frame in deathgrips. In a whirling motion, Kaidoss managed to twist his neck nearly 180 degrees to face the source of the voice. He saw an abnormally tall Gaeni standing just inside the doorway, seemingly taking up all the space and blocking what sounded like someone else standing behind him. Without even looking, the man slapped a few buttons on the wall, causing the doors to snap shut behind him, cutting off whoever it was behind him with a dull thump. Kaidoss felt the fear that he had woken up with drain away under the Gaeni’s dry litany. It also helped that his sluggish mind now finally recognized the familiar doctor scrubs and lieutenant rank markings of Starfleet. Yes, Starfleet. Starfleet was safety. He paused there, as if waiting for a response from Kaidoss. The youth flicked his tongue across his lips nervously, before speaking up in a rough and scratchy voice. “I would--that is--what is the good news?” His stammering sentence ended on a questioning note, before he suddenly remembered his manners and then added, “--Doctor...uh, sssir--?” He snapped his mouth shut on the even more nervous hiss. “Y-yess, Doctor…” Kaidoss hissed weakly, even as he felt his innards relax from unconscious stress. The pandemic that had swept across Seyek and its colonies had left a dark, lingering pall over all of its citizens that were still felt to this day, even sectors away. In fact, it had been one of the main reasons his family had heavily encouraged him to apply to Starfleet Academy, rather than taking the scholarship to a prestigious university on Seyek. And while he missed them dearly, he was determined not to let their hopes down. Oh. Now Kaidoss wanted nothing more than to have a black hole pop into being and swallow him whole. He...fainted. What would his mother say when she found out (and she would, somehow). He...he had been ignoring physical training and exercise for his more interesting science classes, hadn’t he? That will need to change, Kaidoss promised himself. “No need to look like the world’s about to end,” Sadd-har spoke up again, sounding amused. “You’re not the first one in here for that. Though, admittedly, most cadets either learn better or wash out the first year. And the odd Indorian cadet or two who had family in Delin.” The last was more or less mumbled under his breath, as if speaking to himself. Kaidoss cringed again. Fortunately, he was saved from death by abject embarrassment by the chiming of the door, followed by dull thumps of manual knocking. “Well, it’s your medical data,” Sadd-har allowed, raising his padd and tapping in a few commands. With a swish, the doors opened to let in the excitable Caitian noncom, who gracefully turned his surprised stumble into a smooth leap right up to Kaidoss’ bed. “Please tell me you didn’t eat anything he gave you!” was the first thing that came out of the Caitian’s mouth. “What?” Kaidoss mumbled, utterly bewildered by the non-sequitur. With a flourish, the Gaeni pulled a good sized beaker of bright green liquid and placed it on the bedside table. “I’d rather spend the extra days sick than have my tongue numbed for twice the time!” K’Kumarr shot back with a sniff. Kaidoss hated sickbays ever since losing his grandparents to the plague. Any excuse to get out would be worth losing his sense of taste, if it came to that. Grabbing the beaker, he took a deep breath, held it, and then gulped the whole thing down. It didn’t taste like anything going down, if only because that was over in an instant. But the aftertaste that lingered was more like the cinders of a burnt out fire having been shoved down his throat. Or perhaps it was bile rising up. Kaidoss quickly slapped hands over his mouth and tried to take deep calming breaths to keep himself from throwing up. On the bright side, at least the sterile hospital smell of the room wasn’t bothering him anymore. “...surprising data on palate sensitivity of Seyek gusta-olfactory organ structure at low pH range...” Meanwhile, Sadd-har mumbled to himself as he scribbled furiously at his padd. “Your bedside manner is still awful, Doc,” K’Kumarr sighed in resignation. “Poor kid. I figured this might happen. So here, maybe this’ll help.” With that, he plopped a carry out box onto Kaidoss’ coiled lap. “Oh? What’s this?” Curious, the Gaeni doctor reached out to poke the box, activating the release for it to open and expand into a makeshift plate, revealing several muffin-like pastries. The last question was directed at Sadd-har, who had indeed pulled a scalpel out of nowhere, and with a quick move, had split one of the pastries in half. 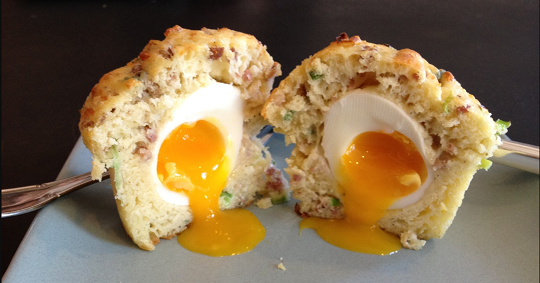 Immediately, gooey yellow yolk seeped out between the seams of the two muffin halves. “You can get your own egg cakes to experiment on, Doc,” K’Kumarr interrupted the mumbling doctor, flicking his hand holding the scalpel away. “Fine.” With a shrug, Sadd-har turned back to the Seyek cadet who was finally breathing like normal again. “Common Earth meats and eggs are fine for Seyek diet, and there shouldn’t be any drug interactions with what you just drank,” he informed Kaidoss. “What? Party?” The last part definitely caught the Seyek’s attention. “They never gave us a party when Gaen joined either,” Sadd-har muttered behind his padd. “Probably because one of you blew up the cafeteria,” K’Kumarr snarked back. “Ah! Yes sir, thank you!” Just now realizing the time, Kaidoss quickly re-folded the carry out box back in again and rushed from the room. Small setback aside, he wasn’t going to let that affect his grades. This entry was originally posted at https://tanithryudo.dreamwidth.org/472538.html. Please comment there using OpenID.